In many mediaeval towns, the friaries, convents and religious foundations often stood side-by-side, providing the surrounding communities with the equivalent of hospitals, hostels, and places of hospitality and welcome. Many of these religious houses came to an end in the 16th century, with the Reformation and the Dissolution of the monastic houses. The estates often enriched political supporters of the Tudor dynasty, but their loss also deprived many people of access to health care and education. Despite the Tudor reforms, many religious communities survived, so that the presence of Franciscans, Augustinians, Dominicans or Carmelite often continued in towns and cities across Ireland and England for many decades because they lived among the people, while Benedictines and Cistercians on the other hand lost the large estates attached to their abbeys and monasteries. In England, many friaries were unable to survive the Reformation. But some survived in new forms because they saw the coming changes and adapted to new circumstances. The tale of two friaries in Lichfield shows how one survived the Reformation and the other disappeared. When the dissolution of the monasteries began 40 years later in 1536, the changes made by Bishop Smyth a generation earlier ensured the survival of Saint John’s as a hospital or almshouse and as a school. The grammar school was separated from the hospital in 1692, but the school continued to use the chapel, and the schoolboys included worthies such as Joseph Addison, Elias Ashmole, Samuel Johnson and David Garrick. Edward Maynard rebuilt the Master’s Hall once again in 1720 to keep up with modern Georgian architectural tastes, and the stone tablet above the doorway dates from this period. By the early 19th century, Saint John’s must have had the character and the problems described by Anthony Trollope in his novels, including The Warden and Barchester Towers. In 1829, a north aisle was added to the chapel and a new three-bay arcade was built. In another major restoration in 1870-1871, the Master, Philip Hayman Dod (1810-1883), repaired and renovated the chapel, raising the walls of the nave, building a new roof, and adding buttresses outside and a stone bell-cote and bell. In 1929, the almsmen’s rooms at Saint John’s were rearranged to overlook the court or quadrangle, giving them more light and modern heating and sanitation. The Master’s House was renovated in 1958, new flats were added in the mid-1960s, and the inner quadrangle was completed with a new building. In the 1960s too, for the first time, married couples were allowed to take residence in the hospital. After Lichfield Theological College in the Cathedral Close closed in 1976, new accommodation was provided in what became the Hospital of Saint John’s within the Close. John Piper’s magnificent stained glass depicting ‘Christ in Majesty,’ was placed in the east window of the chapel in 1984. A sculpture of ‘Noah and the Dove’ by Simon Manby was commissioned by the trustees in 2006 and stands in the quadrangle. At the beginning of this century, the original 1495 east wing of Saint John’s was renovated, enlarged and updated. At present, 18 new apartments are being built at Saint John’s without the Barrs. Completion was expected this Easter, but the project has been delayed since 50 mediaeval skeletal remains – adults and children alike – were found in shallow graves. 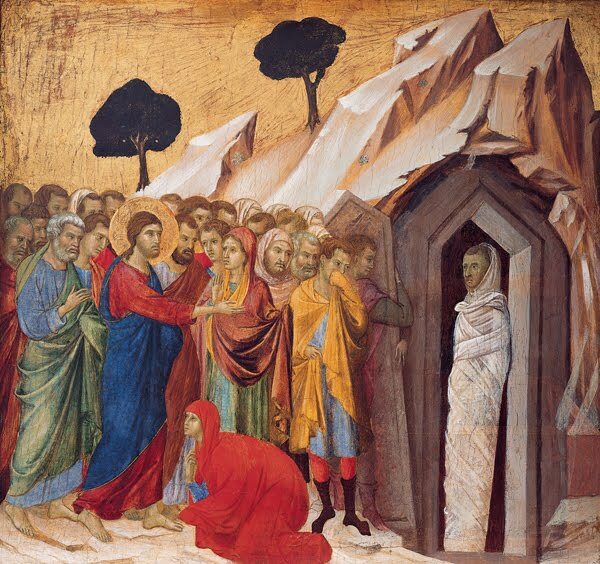 Their remains may help archaeologists learn more about the lives, times and habits of mediaeval pilgrims. 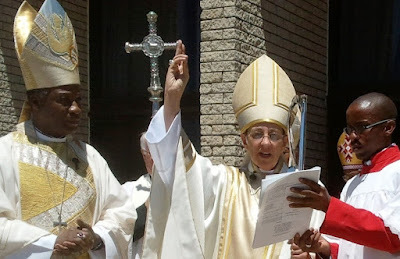 Since the Tractarian Revival, the chapel of Saint John’s has stood in the Catholic tradition of the Church of England. The chapel continues to provide daily and weekly services, and regularly draws a congregation of residents and visitors. 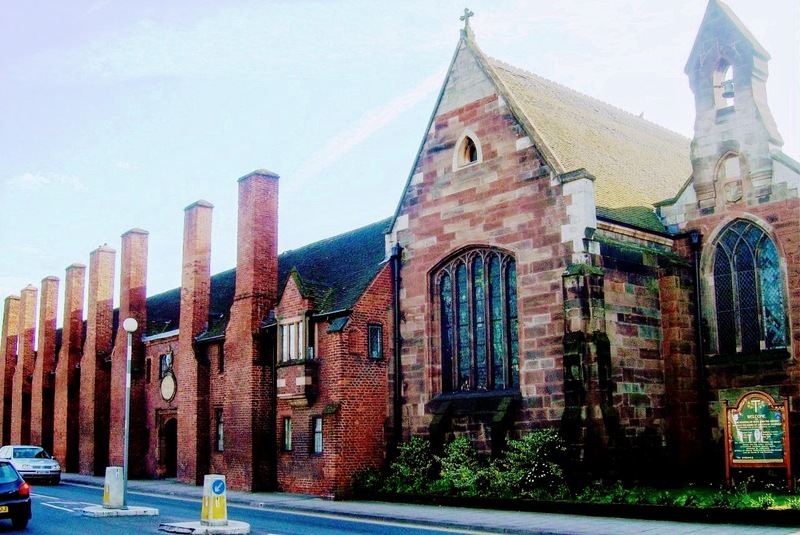 With its distinctive row of eight Tudor chimneys fronting Saint John Street, Saint John’s Hospital remains a living landmark in Lichfield, and the grounds remain an oasis of peace and calm in the heart of the cathedral city. A short distance north of Saint John’s and closer to the cathedral, the Franciscan Friary was a later establishment that once stood in a large estate on the west side of Lichfield. 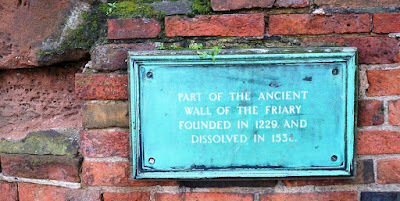 The friary was founded around 1229, when a group of Franciscans or Greyfriars arrived in Lichfield. Henry III gave them oak trees from local forests for building and grants of money, and they were given houses and land by Alexander de Stavenby, Bishop of Lichfield (1228-1238). In 1241, the Sheriff of Lichfield was authorised ‘to clothe the Friars of Lichfield.’ In 1286, Edward I provided eight oak trees from Cannock Chase for further building. When a large fire in Lichfield destroyed the Friary in 1291, the people responded generously and the friary was rebuilt. 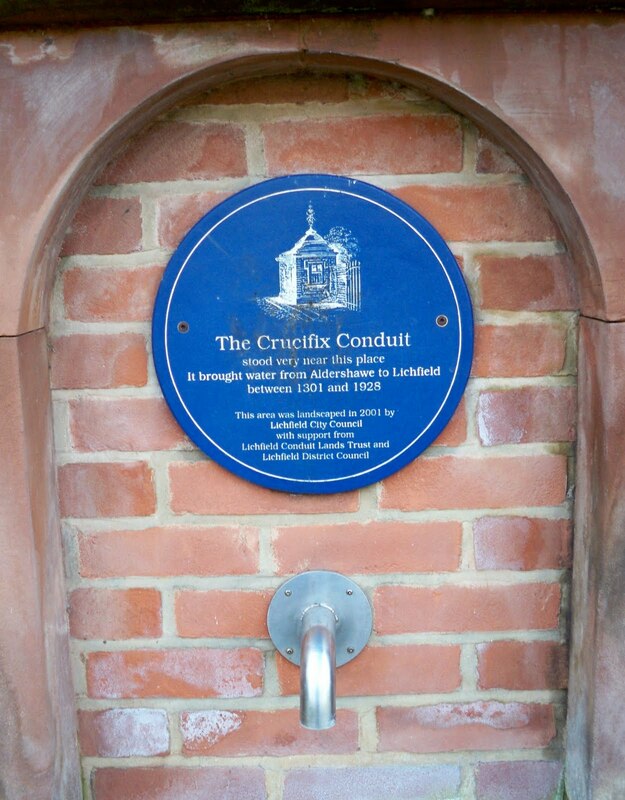 The friars had generous benefactors in Lichfield. Henry Champanar granted the friars a free water supply from his springs at Aldershawe. The Crucifix Conduit was built at the gates of the Friary at the corner of Bore Street and Bird Street in 1301, and remained there until the 20th century. 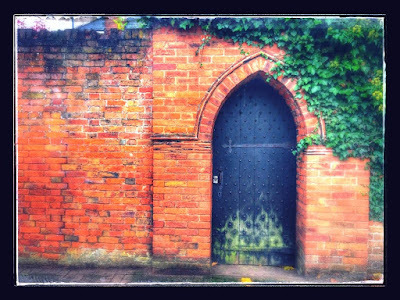 When John Comberford died in 1414, he left 10 shillings for masses to the Franciscan mendicant friary in Lichfield. The friars live a simple life of poverty, chastity and obedience and spent most of their time preaching and caring for the poor and sick of Lichfield. But with the wealth accrued from generous benefactors, the simple timber structures were replaced by large sandstone buildings on a site covering 12 acres. 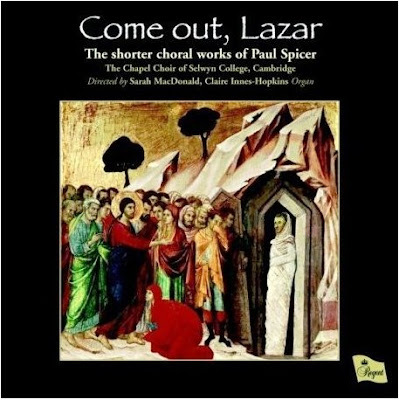 The large church had a nave measuring 110 ft x 60 ft, and a chancel 95 ft x 28 ft; the cloister was 80 ft square. The buildings also included a dormitory lodge, a refectory and domestic dwellings. At the Dissolution of monastic houses, 301 years after the Franciscans had arrived in Lichfield, the Friary was dissolved in 1538. The majority of the buildings, including the church, cloisters, refectory and domestic buildings were demolished, and most of the site was cleared. The only buildings to survive were the dormitory on the west range and a house known as ‘Bishop’s Lodging’ in the south-west corner. 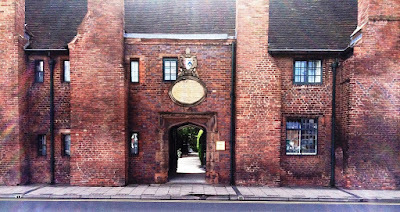 The estate and remaining buildings were sold for £68 in 1544 to Gregory Stonyng, the Master of Saint Mary’s Guild, which provided the effective civic government of Lichfield. He remodelled the buildings for his own domestic use. In 1920, the 11 acres of the Friary estate that remained were bought by Sir Richard Ashmole Cooper, MP for Walsall. Cooper gave the Friary to the city to develop housing and to lay out new roads and suburbs. When the new Friary Girls’ School was built in 1921, the Bishop’s Lodging was incorporated into the south-west of the building. In 1928, a new road named ‘The Friary’ was built across the former site. In building the road, a clock tower was relocated, and much of the west range of the remaining friary buildings was demolished. The site of former friary church was threatened with development in 1933. But an archaeological dig showed the extent and layout of the ruins, and the site eventually became a Scheduled Ancient Monument, preventing any further development. A classical style portico from Sir Richard Cooper’s home at Shenstone Court was set up in 1937 to frame the entrance to the excavated ruins. The site is now a public garden and the slabs showing the layout of the walls of the cloister can be seen on the ground as well as parts of the north wall of the nave. Across the street, The Bishop’s Lodging was the only part of the original Friary that survived. The Friary School moved to the north side of Lichfield in 1975 and the building became Lichfield Library. Now the Library is about to move, and the Friary School building and the Bishop’s Lodging are being converted into modern apartments, not without controversy. 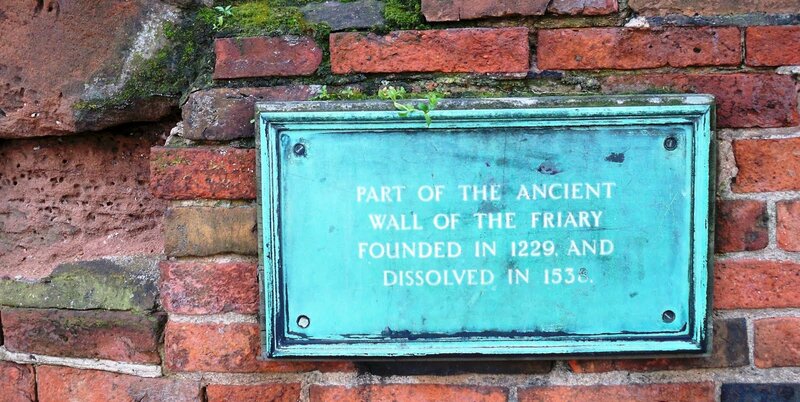 The memory of the Friary is still present in Lichfield today in names that include The Friary, Friary School, Friary Tennis Club and Friary Gardens. 11.15 a.m.: Saint Brendan’s Church, Kilnaughtin, Tarbert, Co Kerry, the Parish Eucharist.